Oh my goodness, is there anything that Rosalie will not attempt to put in her mouth? It doesn’t matter how big it is, she’ll give it a good try. This is made even easier by the fact that she has now worked out that she has two hands and that they work quite well when used in combination! There is no limit to the size of item she can grab now! She’s also found her toes, so in they go at every opportunity. Pretty much everything Rosalie touches now ends up super soggy! Rosalie is turning into such a character now, as she babbles away whilst kicking her legs and gumming her toys, pausing only to grin a toothless smile. It is incredible how fascinating babies are to watch, and how much time you can ‘waste’ just watching them, wondering what is going on in their heads. We took a trip to see my mum and dad for Easter, and we all agreed that Rosalie seemed to recognise Granny and Grandad and Aunty Ellie. I think she reserves extra big smiles for familiar faces. We have also heard the very beginnings of baby giggles, so I feel certain next month I will be reporting that she has mastered laughing. On occasion she has accidentally rolled herself over from front to back whilst craning to see something, so I think rolling over will be on the cards soon too. 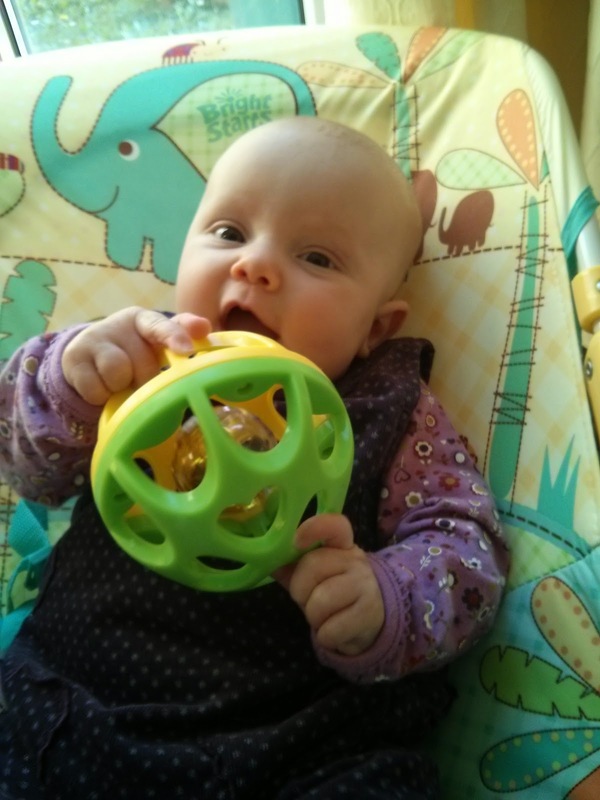 Rosalie at 16 weeks, using both hands to manoeuvre a large ball towards her mouth!